Today it was snowing again. I went for a walk – to get some fresh air and to see some colors. And where do we get it here? Right, shopping 😊 While it is winter outside, it is spring in the shops. As I had mentioned before, the shops this year exploded with shades of pink and red. Which made my girly heart aflutter. So today I went on a color hunt/color study – an idea I got from the book “A Paris Year” by Janice MacLeod (and she got this idea in her turn from another artist and photographer). The point is: you choose a color and then go out searching for it. Last year I did something like that when I dedicated to collect all things yellow. Suddenly they were popping everywhere. It was a fun way to wait for the spring. Today my goal was: pink! I love pink. I never had a Barbie in my life. I was born in Soviet Union, and the Barbies arrived only aftee its fall. I was 12 then, I wanted a Barbie to make clothes for her, but in my family the scarce money could not be spent on dolls. Because of that I never got too much of pink, and when Austrians laughed of Barbie pink, when I lived in Austria, I secretly loved it. I still love it. And seeing it on trend this year makes me joyful. Our eyes get so tired of shy Scandinavian colors like gray and beige, and in winter there is too much of dark color. But when fashion gods said to wear red and romantic, Norwegians obeyed. Suddenly the streets were more like in the South, with red coats, floating ruffles and embroidered pieces. And now – pink. Lovely, just lovely. 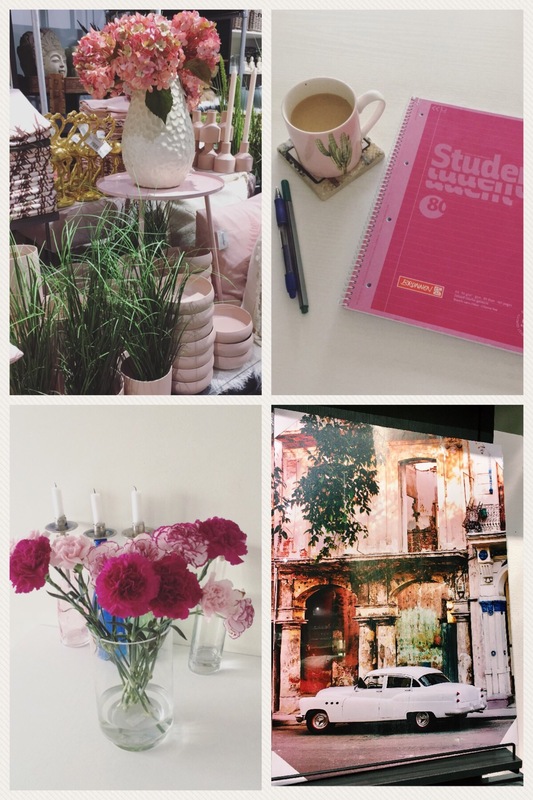 Color hunt for pink starts at my home – with the flowers of different shades, a pale pink coffee cup and my fuchsia note block where I write my morning pages. The cup comes from Norwegian store called Kremmerhuset, selling interior products. I remembered they had more pink – so my walk went there. Here you see that shop’s bowls and a table and a picture of Cuba in sweet macaroon tones. More pics from Kremmerhuset and clothes on display at B.Young. I would love to find a pink pleated skirt and wear it with a gray sweater. What about you? Do you wear pink? I like to go shopping and buying nothing 🙂 I like the novelty of shopping but am not fond of constant consumption. So I have returned empty-handed but full of inspiration. A note to myself: color hunting is fun. 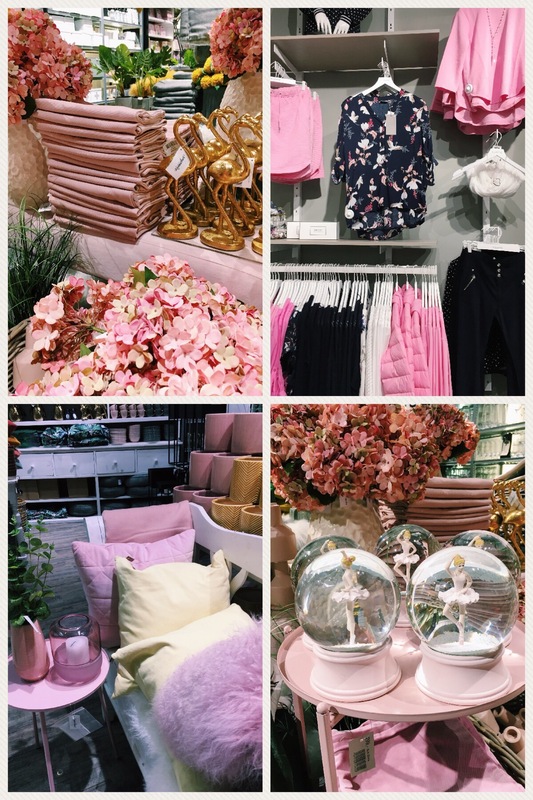 Do you like pink? Do you love playing with color? Join me in this color hunt – or start your own and let me know! I would be excited to join. Let’s spark a rainbow in this gray winter time! I love it how you go out in search of a colour because this is the only way to find it. And it goes for other things in life as well. Oh. My total pink sect just missed a potential member 🙂 But no problem, Manja, I can embrace this difference! Ok, sorry for being ironic (something I enjoy more than pink). I have learnt in Norway that differences are great, and I totally agree with it now. So what is your favorite color? Oh, purple is one of my very favorites too. Thank you for sharing! And you can go out and search for any color you’d love! It’s green. Ironic is good too. For example, I don’t like Barbies but I shall make a Barbie post one day, you’ll see. Here’s to good times! Oh, green is difficult. Cuz it’s everywhere 😆😆 I love irony, but I don’t want to offend anyone. So it’s a tricky sport 🙂 good that it is good with you. You see how the pink charms even those who are not pink 😉 Oh, my writing… Merci. First now I start to loosen on my language, was so stiff about it all this time.